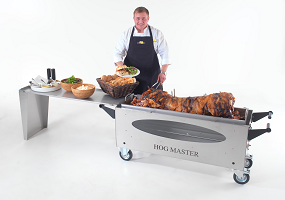 Have you ever considered holding a hog roast party in Worcester? If so then you probably won’t be the first to be thinking along those lines because Taste the Cracklin’s hog roast is fast becoming one of the catering success stories of the twenty first century in the UK. It is quite evident that catering in this country is finally emerging from the dark ages of its catering nightmares and blossoming into a country that can at last be proud of the food that it serves at events and parties. Turn back the clock a few years and you will see that catering at events in Worcester and indeed at locations throughout the nation was something of a car crash. What were we thinking that made us settle for some of the food disasters that we inflicted on our friends, relatives and special guests? Why did we feel that a special event warranted the serving of sandwiches? Okay, not all events were like this but more than a fair few indeed were, and it is pretty embarrassing to look back on these times and find any positives to take. Thank goodness then for the good people that are Taste the Cracklin, the hog roast caterers of Worcester, for they are the wonder caterers that are helping to change the face of catering in the UK for the better. Not content with seeing people suffer the miseries of dreary food at events that should really be special, the caterers are busy building up a whole army of followers for their delicious meat, and that is great news for everyone here in Worcester. The City of Worcester is a place that deserves great catering. So it should, because this is the city that has given a lot to the UK and the world in general. What about Worcester sauce or Royal Worcester porcelain? These are things that will be with us for generations to come, so surely it is only fair that the near 100,000 people who live in this historic city should feel some reward with a better standard of catering? Well, with Taste the Cracklin, that is most certainly what they are getting. Hog roast really is a classy form of catering that eclipses almost any other sort of catering that you can think of, and you may be surprised to learn at just how versatile roasted pig can be when it comes to pretty much any sort of special event. We all know and love the typical party style event that happens every now and again. It may be a big birthday celebration such as a 21st or maybe a wedding anniversary. Well, whatever the event, the catering can help transform it into something really special, and with hog roast rolls from the magic hands of our chefs, you simply cannot go wrong. Rolls sound so basic don’t they but these are anything but. A hog roast roll (or ‘pig in a bun’ as you will sometimes hear them referred to) are actually a fantastic meal in a roll. Think about this and try not to feel hungry; delicious, hot and succulent hog roast meat, topped off with apple sauce and a bit of crackling. It really is mouth-wateringly fantastic and tastes incredible. Easily the most fun you can have with a bun. But what if you are planning an event that is, shall we say, a little more formal? Maybe it is a corporate function where you have some rather important guests attending? Well, Taste the Cracklin style can certainly make the difference. Hog roast for corporate events is an inspired choice, not simply because the food tastes incredible but because it looks incredible as it is being roasted by the chef. The pig looks amazing as it is being slowly cooked and this is sure to impress your guests as they enter the venue, as will the remarkably addictive aroma of roasting meat. But better still is how the meat can be presented. No rolls here, just great looking plates of superbly carved meats, complete with vegetables, potatoes and crackling. It looks amazing and tastes even more so. It is the sort of catering that will change the way you think about future events and it will definitely earn Taste the Cracklin a permanent place in your corporate dining address book. Make that Worcester event a roasted pig event and you will never look back!